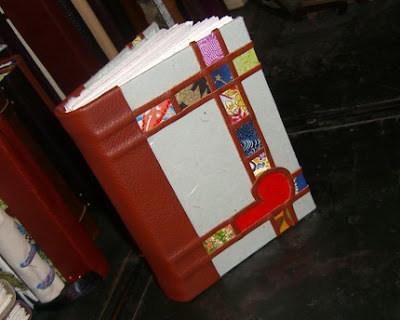 Bookbinding Etsy Street Team: Congratulations to RedPumpkinStudio! 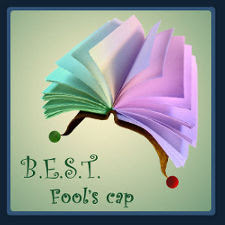 RedPumpkinStudio is the winner of the BEST Fool's Cap Award for 2010! Congratulations Jen! 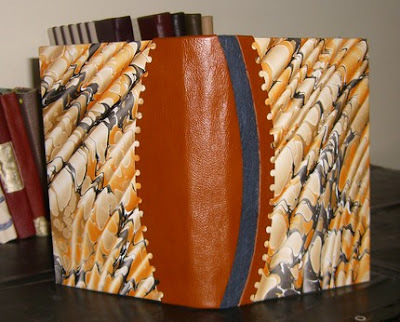 Jen's Harlequin Boxes received the most votes in our poll so she is hereby awarded the BEST Fool's Cap Award for 2010 which includes unlimited bragging rights, permission to use the Fool's Cap Award graphic on her own website, and this little feature here on the Bookbinding Team blog. The Harlequin Boxes that she made for our Carnival Challenge are a wonderful representation of carnival spirit. 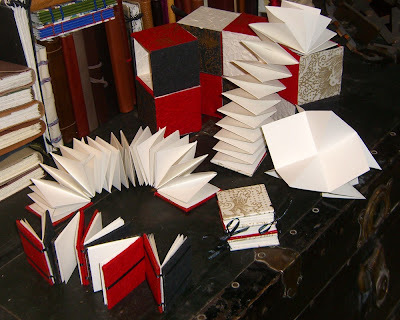 The trick boxes open and close in different directions and contain an array of quirky and confusing little books. As she states in her description of this piece, it "is inspired by carnival's anarchy, disguise, mystery, games, and wonder." Thanks to all who participated and to those who voted, and again, congratulations to Jen and her Harlequin Boxes! Congratulations Jen! What an awesome entry, and well deserving to be the winner! Congratulations, J! Awesome creativity! Beautiful work!